Heya! This post was updated on March 27th, 2018. After two weeks in Paris, we rented a car and drove out to Loire Valley. Stopping in Chartres along the way, we settled in Amboise for three days of fairytale castles, wine, and ice cream. At the charming Closerie Saint-Vincent, we enjoyed a super-delicious homemade breakfast each day. If you're looking to stay in the center of town, try Le Vieux Manoir or one of the traditional hotels. If - like us - you're traveling this day, plan to visit the Château du Clos Lucé after you arrive in Amboise. It's a must if you love DaVinci, but won't take as much time as the larger chateaux you'll visit. Spend an hour or two seeing where Leonardo spent his final years, and the working models of his inventions throughout the home and gardens. Or, visit the royal Château d'Amboise on the river instead. Walk through town when the afternoon is over, and have an early dinner at one of the restaurants along the main street - it's a popular area, so many places have non-stop service. After dinner, drive out to meet your group for a sunset hot air balloon. It's a dreamy introduction to the region, and a surprisingly tranquil ride. 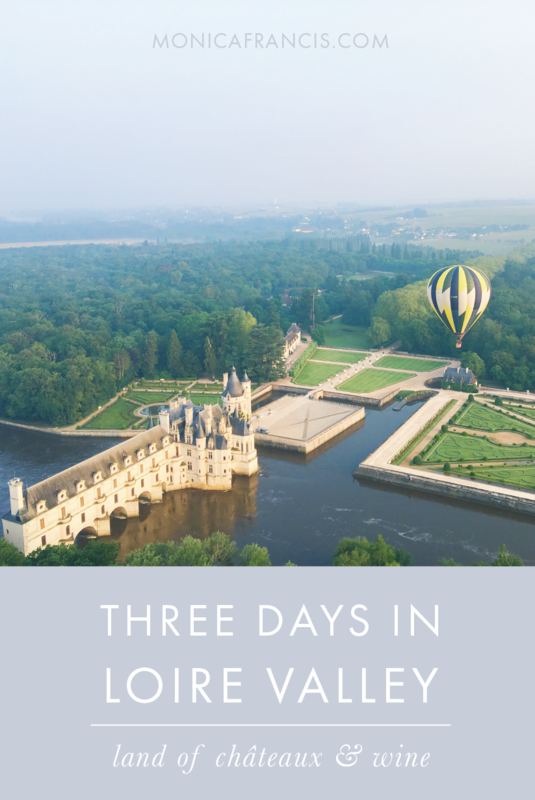 This was a bucket list item for me, but after such a beautiful flight over Château de Chenonceau and a champagne toast at landing, I might have to make an opportunity for a repeat! When you're headed to Château de Cheverny, plan to arrive in time for the feeding of the castle's hundred hunting dogs at 11:30am. Explore the grounds and kitchen gardens, then gather around the kennel for the famous spectacle. Next, make your way through the furnished château and out into the peaceful back gardens. We had lunch at the Orangerie restaurant here - sit at an outdoor table for table service, or order inside for a quick snack. On a weekday morning, Cheverny was quiet and far from crowded, a perfect precursor to our next stop. Make the short drive over to Château de Chambord for the afternoon; it's the most visited château along the Loire, and the largest one we saw. Whenever you're there, be prepared for crowds and tour groups. The grounds are expansive but have no gardens, so spend your time exploring the royal castle itself. Climb all the spiral staircases you can between the many floors, wings and balconies - and make a point to stop and admire the architectural details of the place. When you're done touring, take yourself to the riverside city of Blois for a leisurely dinner and a stroll around the town in the evening. It's much bigger than Amboise, so there's a bit more variety in restaurants, people to watch, and places to shop. Plus, it's right on the Loire River; a wonderful spot to be for sunset. Spend your last morning at Château de Villandry. The interior of this castle is pretty and well-kept - definitely worth a visit. But the real attraction here is the beautifully designed gardens, so head outside and explore for as long as you can. After almost two hours, we made our way out and stopped for a quick lunch just outside the castle gates. There's a small stand that serves the most delicious (and photogenic) rose ice cream, and a table service restaurant, too. The final château was my favorite: Château de Chenonceau. The gardens, grounds, and castle itself are all fairytale-perfect. They even have row boats, lemon trees, donkeys, and a balcony! Do yourself the favor of lingering long enough for the crowds to thin out while you enjoy a glass of wine or an early dinner at one of the restaurants here. Chenonceau is open later than most places in the region, so you'll have plenty of time to wander and take photos before the gates close for the evening. 'star' the map below to access it from the google maps app on your phone!